While Molly lives in Camden and worked for International Marine Publishing, she now is chairman of the board of the Apprenticeshop in Rockland. They are instumental in experiential education. The school hosts 5-85 sailing students with several unique programs. It’s the only school with a 7 month, full day program running April thru October. There are also leadership camps for young teens that teach self awareness and team skills. The programs teach woodshop, sailing and building. They offer 7 day open boat expeditions which teaches seamanship. Boatbuilding for high schoolers teaches math and other stem requirements. The Apprenticeshop is also reaching out to other schools to fill non-traditional learning methods. There are 2 year programs and intensive 2 week programs. There are two floors of building space and a working pier. They build all kinds of wooden boats, teaching the community, craftsmanship and traditions of the sea. The programs are all inclusive, even hosting artists and musicians. The Apprenticeshop will be celebrating the 50th anniversary in 2022. The shop takes in 20 students per year in the 2 year program and 300 students in other 1-9 weeks programs. Their budget runs around $577000, there are 4.5 full time staff with 10 more seasonal instructors. Spread the word about us, apprentices need places to live while in program, teach your grandchildren to sail! We need more board of directors and volunteers. They are a nonprofit organization and would like to build a scholarship fund for local students. A one week sailing program for children runs $290, GI bill works for veterans and there is an international program available as well. District meeting in Quebec included education sessions, president’s meetings with round table discussions, building membership and public image discussions. Polio walk last weekend and a great time was had by all, about 50 walkers, interact kids as well, $1000 from the club, $900 donations, still taking a more donations thru next Thursday! 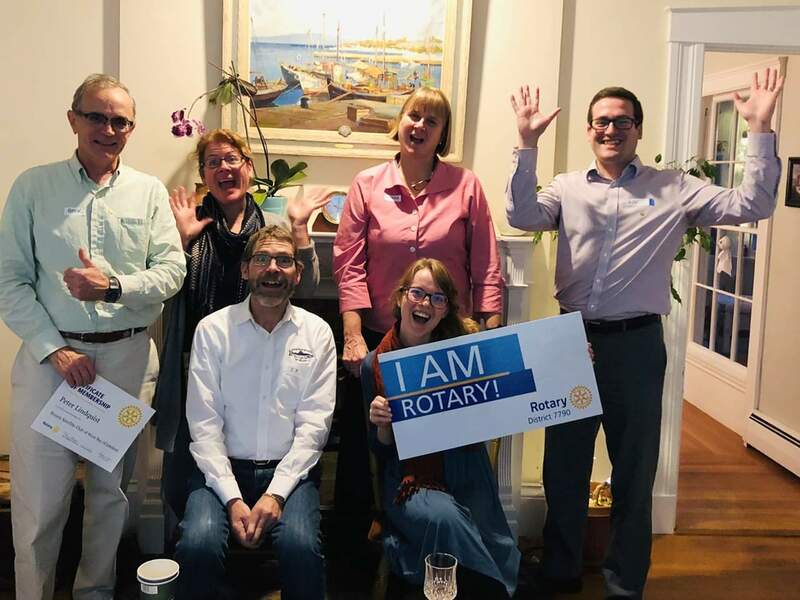 Thursday evening, a group of West Bay Rotarians welcomed members of the new satellite club in Rotary! 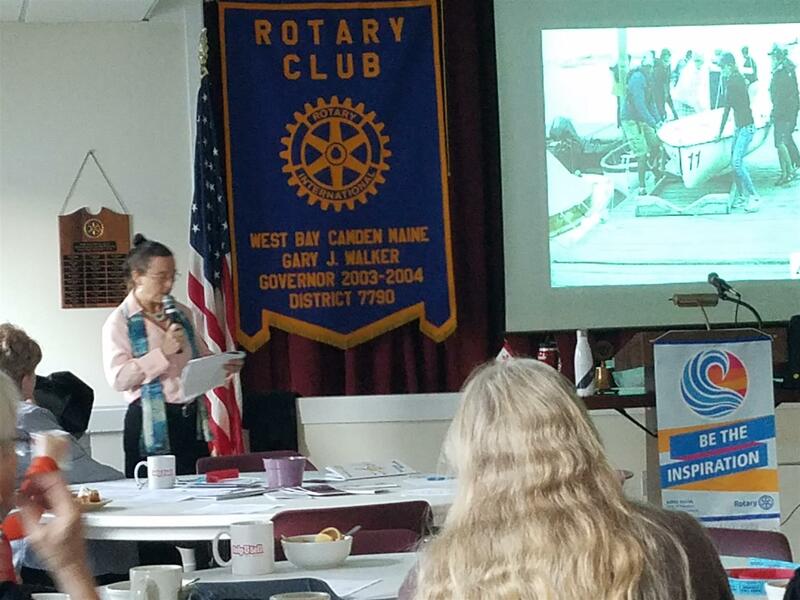 Welcome to the charter members of the Rotary Satellite Club of West Bay, Sunset. International Committee pledged Mike Moore’s expansion in Tanzania Project. Christmas tree sales – signup sheets are out! Ray will be sending an email with flyers to go to businesses, offering free delivery on wreaths and garland. The extra shopping items will be offered again. The hut will be a little warmer this year and will have Keurig coffees! George – youth exchange will send 2 students on long term exchanges with a NH club. Membership – Are looking into offering different forms of membership. More to come! Interact – Will be participating in a packing party for One Less Worry and activity at Ronald McDonald House in Portland.